This is one of the most fabulous and impressive Moroccan recipes I have ever prepared. I was amazed at the flavor. It's a combination of sweet and savory and salty. Chicken is stewed with ginger, cinnamon and saffron. 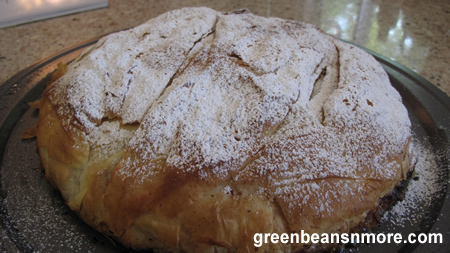 It's then layered between thin sheets of filo dough along with almonds, confectioners sugar and cinnamon. I thought this certainly was the essence of Moroccan cuisine. This fabulous dish is from an amazing cookbook called Cooking at the Kasbah by Kitty Morse. I've been doing a lot of cooking out of this book. The recipes are easy and very tasty. To make the filling: In a large enameled saucepan or small Dutch oven over medium heat, heat the oil. Saute the onion until golden, 6 or 8 minutes. Add the chicken, parsley, cilantro, turmeric, saffron, water, ginger and cinnamon. Cover and cook until the chicken is tender, 20 to 25 minutes. With a slotted spoon, transfer the chicken to a bowl and set aside to cool. Let the sauce continue to simmer in the pan and add the beaten eggs, salt, pepper and sugar. Stir constantly until the eggs are scrambled. Bone and shred the chicken and add it to the eggs. Set aside. To make the almond mixture: In a blender or food processor, coarsely grind the almonds. Transfer them to a small bowl and mix them with the sugar and cinnamon. Set aside. Preheat the oven to 425 degrees F. Remove 12 sheets of phyllo dough from the package and rewrap the remaining Phyllo in it's original plastic wrap. Refrigerate for another use. Stack the 12 sheets on a work surface. Using a sharp knife, with a 12 inch pizza pan as a template, cut through the stacked phyllo sheets. Discard the scraps. With a pastry brush, paint the pizza pan with a little melted butter. 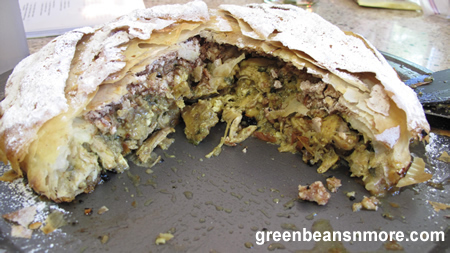 Keep the phyllo leaves covered with a damp cloth as you work. Layer 3 rounds of phyllo leaves on the pan, lightly brushing each with melted butter. Sprinkle the third leaf lightly and evenly with the almond mixture. Layer and butter 3 more leaves. Spread the chicken mixture evenly over the top, leaving a 1 1/2 inch border of phyllo. Fold over (up) the edges to partially cover the chicken mixture. Layer and butter 3 more leaves over the chicken, sprinkling the remaining ground almond mixture evenly over the top. Layer and butter the last 3 leaves of phyllo over the almond mixture. Tuck the edges of these last 6 leaves under the b'stila as you would make a bed sheet. Bake the b'stilla until golden brown, 20 - 25 minutes. Place the powdered sugar in a fine-meshed sieve. Tap the sides of the sieve to cover the surface of the b'stila lightly and evenly with sugar. Using your thumb and forefinger, sprinkle cinnamon in 6 or 8 intersecting lines to create a diamond-shaped pattern or use a paper doily or template to make your own individual design. Serve immediately before pastry becomes soggy. This recipe makes one 10" pie that easily serves 4. Note from the author: I often prepare several b'stillas at one time, baking and serving one while freezing the others unwrapped in aluminum foil. They will keep for up to 2 months in the freezer. There is no need to thaw a frozen b'stila before baking, but it will require about 10 more minutes in the oven. Cooks Tips: This was the first time I worked with phyllo dough, and it was easier than I thought it would be. Just follow the directions and keep the filo dough covered. The first time I made this I had a lot of left over butter, so the second time I made it I only used one stick. It wasn't enough. These were two different brands of phyllo. You may need more, or less butter depending on the dough itself. The first time I made this amazingly beautiful round b'stila pictured above. The second time I made this recipe I halved it and made two square chicken pies, cooking one and freezing the other. * Place the desired number of saffron threads in a small non-stick skillet and stir constantly over medium-high heat for 2-3 minutes. Crush the threads between your fingers or grind in a mortar. To blanch almonds: Place the almonds in a bowl. Pour boiling water over to barely cover the almonds. Let the almonds sit for one minute - no longer. Drain and rinse under cold water, drain again. Pat the almonds dry and the skins will slip off. Try another wonderful Morrocan dish from "Cooking from the Kasbah" Garlic Beef with Cracked Green Olives.